If you have a tooth that is badly damaged, discolored, or decayed, our dentists may recommend a dental crown to help you. Dr. Hildebrand may use a crown to improve the appearance of your smile, enhance its function, and strengthen weakened teeth. Our team at Preston Hollow Specialists invites you to contact us today if you would like more information about a dental crown in Dallas, Texas. If you are missing one or more teeth, our dentists may recommend a dental implant to restore your smile to its ideal function and appearance. 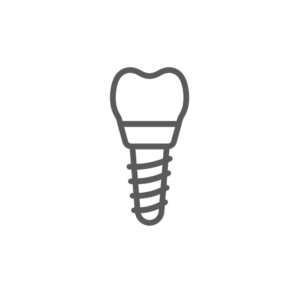 Dr. Hildebrand frequently recommends a dental implant because it can give you the beautiful, functional smile you have always wanted. Please feel free to contact us at Preston Hollow Specialists today if you would like to learn more about the benefits of dental implants in Dallas, Texas. If you would like to replace one or more of your natural teeth, Dr. Hildebrand may recommend a dental bridge to help you. Dental bridges—which consist of at least one artificial tooth—can be matched to the color, shape, and size of your existing teeth. Our dentists recommend a bridge to hold your natural teeth in place, restore your ability to chew comfortably, and complete the appearance of your smile. If you would like more information about a dental bridge in Dallas, Texas, please call us at Preston Hollow Specialists today. Dental inlays and onlays are restorations commonly used to repair damage to a tooth that is too extensive for a filling but not extensive enough to require a crown. Dr. Hildebrand and Dr. Sanovich can also match an inlay or onlay to the color and shape of your existing teeth. Our dentists invite you to contact us at Preston Hollow Specialists today if you would like more information about dental inlays and onlays in Dallas, Texas. Our dentists at Preston Hollow Specialists can use dentures to restore your smile. Dentures are removable appliances that can be used to replace missing teeth and complete your smile. Please feel free to contact us today for more information about how our team can help you with dental veneers in Dallas, Texas.